Poverty in Wisconsin rose in 2018 even though jobs were expanding, according to the 10th annual Wisconsin Poverty Report. The rate of poverty in Wisconsin increased in 2016 as compared to 2015, despite low levels of unemployment in the state, according to the Wisconsin Poverty Measure. The official poverty rate also increased, and the market-income poverty measure, which reflects employment levels and can be used to measure economic health, also rose, even though there was job expansion in that period. The 10th annual Wisconsin Poverty Report, released in June 2018 by the University of Wisconsin-Madison’s Institute for Research on Poverty (IRP), revealed that poverty in Wisconsin rose by 1.1 percent between 2015 and 2016 to 10.8 percent. The official poverty measure places poverty at 11.8 percent and the market-income poverty measure is at 23.2 percent. The report found that child poverty has also increased in the state to 12 percent in 2016, up from 10 percent the previous year. The picture in Dane County doesn’t differ much from the state level, with poverty being down from 11.2 percent in 2015 to 10.8 percent according to the Wisconsin Poverty Measure. It is currently at 11.3 percent according to the official poverty measure of the U.S. Census Bureau. Under United Way of Dane County’s Asset Limited, Income Constrained, Employed (ALICE), which incorporates more than just poverty, says that 25.8 percent of people in Wisconsin and 21.4 percent in Dane County are struggling to make ends meet. Poverty is when an individual lacks a usual or socially acceptable amount of money or material possessions, according to Encyclopedia Britannica. It exists when people lack the means to satisfy their basic needs. In the context of basic needs each country in the world determines what those basic needs are and the definition can be tailored to only incorporate those in extreme poverty that are close to starvation, or be as broad as to encompass a large part of the population. For example, in the U.S. the poverty threshold is $12,043 annually for a single individual, whereas in the United Kingdom it is around $15,734. The difference comes from the definition of poverty, which in the Europe Union is set at 60 % of the national median equalized disposable income (after social transfers), and in the U.S. the official poverty threshold is standardized to consumption patterns from the 1960s. There are four main ways to measure poverty in Wisconsin and each takes into account different factors and defines basic needs differently. There is the current official poverty measure of the Census Bureau, which was developed in the mid 1960s by Mollie Orshansky, a staff economist at the Social Security Administration. The way the official poverty measure works can distort the reality of poverty in the U.S., as it doesn’t take into account multiple things. It has been criticized by both scholars and policymakers for not being able to accurately account for the contemporary needs and resources of families. The official poverty measure doesn’t take into account non-cash benefits and tax credits, makes use of a poverty threshold that is based on consumption patterns from the 1960s, and doesn’t take into account expenses such as childcare and healthcare. It also doesn’t account for the differences in prices between geographic regions. The official poverty measure only considers earnings and cash benefits. An alternative to the official poverty measure is the market-income poverty measure that ignores government taxes and benefits, and only looks at private earnings and income. The market-income poverty measure looks at who would be poor if all that was counted was what a person’s yearly earnings from salaries and investments. However, a lot of people don’t have jobs and investments, which is why this measures shows a higher poverty rate. “If you look at the elderly, they have pretty little market income on average, but once you count social security, the elderly poverty rate drops dramatically,” Berger said. The IRP’s 10th annual Wisconsin Poverty Report, uses a measure that accounts for things that the U.S. Census Bureau’s official poverty measure doesn’t, such as how non-cash public benefits and taxes affect poverty. The Wisconsin Poverty Measure determines the least amount of income that is needed to cover the basic life expenses. Three components are used to make this determination: resource-sharing, resources and need. Resource-sharing is all people that share the same residence and are assumed to share both income and consumption, which is often labeled a family support network. The Wisconsin Poverty Measure expands the definition of the official poverty measure to include “unmarried partners and their families, foster children, and unrelated minor children.” It excludes single college students earning less than $5,000 because they are likely to be receiving financial support from their families and skew the poverty data. The Wisconsin Poverty Measure also includes a more expansive range of resources. While the official measure considers only pre-tax income, the Wisconsin Poverty Measure incorporates “federal refundable tax credits (the Earned Income Tax Credit or EITC, and the Additional Child Tax Credit or ACTC), and non-cash benefits such as SNAP and housing subsidies.” It also adjusts for household needs, such as medical, childcare and transportation costs. For the component of need the Wisconsin Poverty Measure bases its thresholds on food, clothing, shelter, and other expenses for a family of two adults and two children, while adjusting for prices in the state. 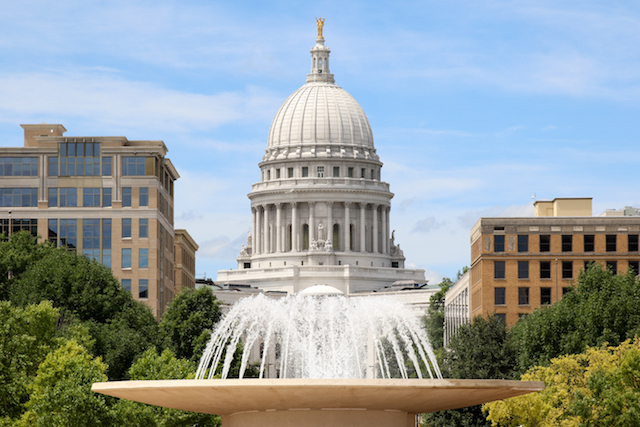 The 2016 national poverty threshold was $29,380, while the Wisconsin Poverty Measure places it’s threshold at $26,511 because the cost of living in the state is about 8 percent lower that the nation as a whole. United Way’s ALICE measure represents the minimum income necessary based on a household survival budget, which looks at a household survival budget, which is “an estimate of the total cost of household essentials — housing, childcare, food, transportation, technology, and health care, plus taxes and a 10 percent contingency.” This measure incorporates a larger amount of people as it takes into consideration people in poverty and those that struggle under the ALICE definition.